Here in the Chicago suburbs, we had two options for whole-home DVR services. 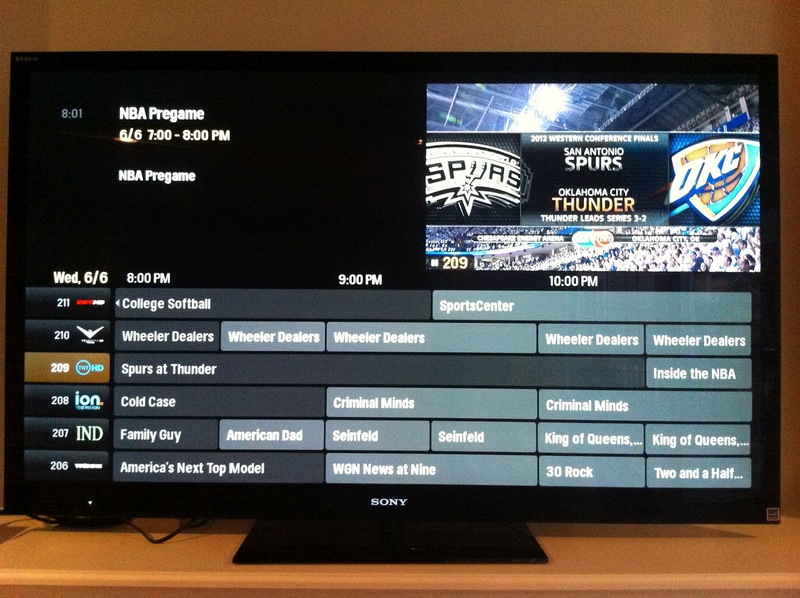 We initially went with WOW Ultra TV, and after about 4 months, we switched to DirecTV's HR34 Genie system. Both Ultra TV and Genie have their plusses and minuses. Both offer 1080p output, but that's primarily for the menus, as most TV content is provided at lower resolutions. Both systems have a similar design architecture - a central hub, with multiple tuners and a large hard drive, recording and storing all TV shows, and distributing them to televisions around the house upon request. 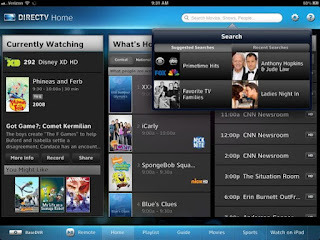 Both systems also bring a number of "add-on" apps and have ways of accessing "on demand" content. WOW! stands for "Wide Open West", a regional cable/phone/internet provider, generally operating around some great lakes states - Michigan, Ohio, Illinois. Their website is wowway.com. With UltraTV, WOW! attempting to leapfrog their larger competitors with a high-tech whole home DVR solution. WOW! doesn't require a contract - if you want to give UltraTV a test drive, you can keep it for a single month and then downgrade or cancel service. The primary Ultra TV box is large, but sleek. It's not just your whole-home DVR... it's also your VOIP box, your cable modem, and can even be your wi-fi router. I use an Apple Time Machine, so I did not use the Ultra TV box as a wireless router. Because Ultra TV is handling your VOIP calling, it displays CallerID information onscreen. That's nice. All of this all-in-one functionality comes at a small price - the box needed to be in my home office, because that's where the computers are - but where the TVs aren't. As such, both of our TVs were on the (very small) "client" boxes, and all recordings had to be streamed through the UltraTV network. WOW! really hypes the "Smart Menu" interface (right), probably because it's unique and differentiates them to some extent. Unfortunately, it's borderline unusable for browsing live TV. 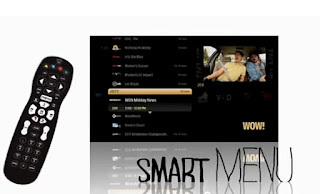 When using the Smart Menu, you scroll vertically through your channel list, with about 8 channels visible onscreen at a time. The major drawback - you can only see what's playing at that particular moment. If it's 8:56 PM, you're interested in what will be on at 9:00 - but the guide will still be showing you the list of shows that are currently on - even if they started at 8:00 and 8:30. What this means, in practice, is that everyone uses the "Grid Guide" (right). Unfortunately, that's not a great solution, either. WOW! really wanted to show off the channel logos - and that's neat - but they provide the channel logos in lieu of the channel names. You'd better be good at recognizing channel logos, or you'll never be sure what channels you're looking at. Also, the text in the Grid Guide is small. REALLY small. I have 20/20 eyesight and a 55" TV, and I could not read the Grid Guide easily from across the room. Navigation can get a bit laggy. Not "Comcast Motorola Box" kind of laggy - just bad enough that you occasionally wonder if a button press was registered, press the button a second time, and wind up overshooting your target. Finally, menu navigation with Ultra TV is just strange. 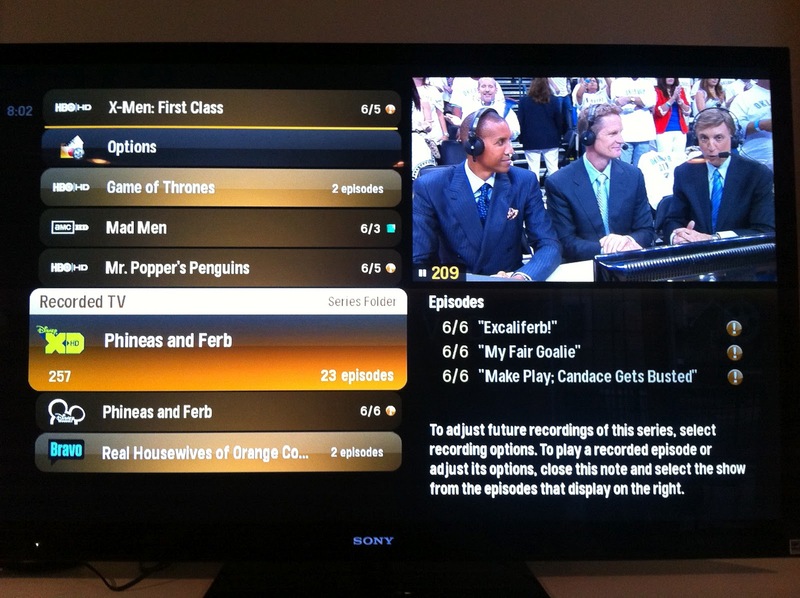 Selecting a prerecorded show requires the user to navigate to the show's name, and WAIT a while. (If you click "select", you'll see upcoming showings for that program.) If you wait a few beats, your recordings show up to the right - then you can navigate to the recordings and select one. It's completely counterintuitive. Even stranger is the method for browsing and selecting on-demand content. As you navigate deeper into animated menus, selecting a genre, then a channel, then programs, then a particular episode, you occasionally have to move to the right to move "deeper", occasionally to the left, and occasionally pressing select. After 3 months with the system, I was still a total novice. A major drawback, for me, was the lack of an iPad app. All of the problems with the Grid Guide and Smart Menus and On Demand would melt away if I could just select programs from a second screen. Oh well. They do have Flickr, for what that's worth. To me, not much. The "Ultra Arcade" is a series of videogames (blackjack, and so on) that you play with your remote control - it's very, very similar to the videogames available on airplanes with "personal entertainment" screens. I tried them once. I'm sure that's about the average. Smart TV *does* support streaming media from your home network - be warned, however, that this requires some specialized software (and hardware). I didn't get it to work, but by that point, I wasn't trying very hard, either. WOW! Ultra TV isn't a bad solution. Any Whole-Home DVR is a major leap forward - just the idea that recordings can be accessed anywhere in your house, instead of "stored on a particular TV", is fantastic. That said, it's an undercooked, strangely designed TV solution. Our installation took no fewer than FIVE visits from WOW! - and three Ultra TV boxes - before things were working properly. The system would occasionally freeze, requiring a hard reboot of both the main hub and client boxes. The composition of the channel lineup is a little strange. All of the standard channels, HD channels, and movie channels are grouped together, instead of any attempt to group by subject matter. Moreover, the channel lineup just doesn't quite compare to the competition. My wife watches several shows on Bravo, for instance (yeah, that's the ticket - just the wife), and it's ONLY available in standard definition. There's no NFL Network, which means Thursday Night Football is out. All told I can't recommend Ultra TV. Not at $165/month (for phone/internet/"standard tier" TV), and not when there are better alternatives out there. 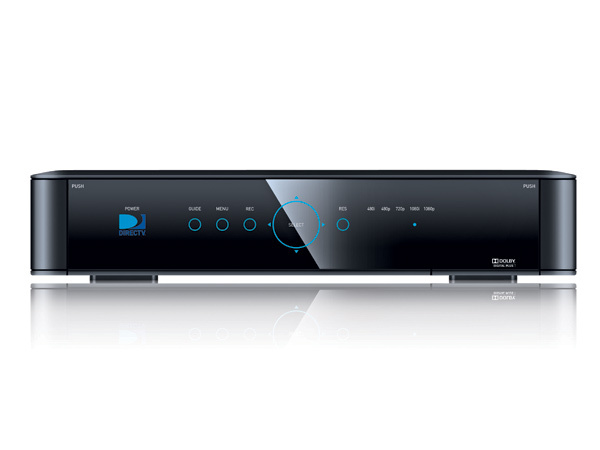 The DirecTV Genie is the new brand name for the HR34 Home Media Center whole-home DVR. It's such a major step forward for DirecTV that even three months after install, I kind of can't believe that it exists. When we got the HR34 last fall, we had to pay a $100 equipment fee. Based on DirecTV's new marketing, however, that fee is no longer being charged, and the "Genie" is now free. It was worth the $100. The Genie HR34 can record 5 HD channels at once - while playing back a previously recorded HD show. That said, it is awfully big. Like, "almost as big as a stereo" kind of big. It will fit into your media cabinets with no problem, but be aware that it's quite a bit larger than your previous DirecTV box. It's approximately the same size as the Ultra TV box - and that one had a cable modem/router and VOIP circuitry in it. So be forewarned. At the same time, the "client" boxes are just ridiculously small. Approaching "3rd gen AppleTV" kind of small. And still stylish, with the blue LED logo. Whoever is designing equipment at DirecTV is doing a fantastic job - this client box is the size of a paperback book, and it's fully capable of pushing 1080p video streams. And if you have RVU-enabled TVs, you don't need a client box at all. We're living in the FUTURE, man. We have, on rare occasions, had recordings "lag" a bit on the client box. It seems to pause for a few seconds, and then continues with no issues. It's strange, but this almost only seems to happen with my son's recordings of "SpongeBob Squarepants". Not sure what the issue could be. It's not a major problem, however. Text is bright white, and legible from across the room. As you scroll through shows in the guide, it displays the corresponding movie posters, TV cast photos, and so on. It's a really nice touch - and more comprehensive than you'd expect. It's uncommon to see an empty placeholder graphic. Pushing "up" on the remote brings up a 9 tile "quick change" pop-up - you can set your favorite 9 channels, and their logos will appear here. One drawback - DirecTV has a *ridiculous* proliferation of home-shopping infomercial channels. And it's often the same channels repeated throughout the guide, with channel names like "LOOK", "SALE", and "BUY". You are essentially required to set up a custom channel list. Over the course of the last 4 months, DirecTV has refined the HR34 software, consistently making the interface more responsive. At this point, lag is nonexistent. Finally, one feature that has snuck up on me to join my favorites is the "what's on now" page - DirecTV provides graphic tiles of the most-watched shows that are currently playing - and selecting the graphic takes you directly to the show. "Hey, Jimmy Kimmel is on. That'll do." Even if you keep the guide open and keep looking for something else to watch, this feature eliminates the 2-3 minutes we all previously spent looking for *something decent* while some show we disliked played in the background. DirecTV's iPad app is just mindblowingly good. I can't believe it works like it does. -It's essentially magic. It's incredibly fast. It allows you to search for and set recordings, download entire seasons of on-demand content, and change the channel on any TV on your network. And for a lot of programming, you have the option to watch on your iPad. The app provides all of the scores for games that are currently being played - and clicking on the score gives you the option to immediately change the channel to that game. The app provides the 5 shows that are, at that moment, the most-watched nationally and in your time zone - again, clicking on the title lets you watch the show on your TV or your iPad. The extras for the Genie system itself are also great. Their YouTube implementation rivals the AppleTV (which is still the undisputed champ, IMO.) There's Pandora, and games and so forth - and they're fine, but we (and you) presumably have better options for music and video games. You're going to have to get a satellite dish installed on your roof if you go with DirecTV. For many, that's a serious drawback. In our case, it's on the back of our house so we never see it. In theory, satellite TV will not work in serious weather. We haven't had any outages yet, even in big rainstorms. I have seen DirecTV lose signal at other people's houses in the past, so I'm not sure if this is a "new dish tech" issue or if we've just been lucky. At the moment, we're paying about $65/month, with HBO and Showtime. That's an increase from the $50 we paid for the first three months, and this price will increase during the second year of our contract, too. Over the course of a year, that adds up to a lot of cash, and I'm sure some cable-cutters will balk at that bill. But thus far, DirecTV feels like a TV company that is really trying to deliver value for your money. Their iPad implementation shows real attention to detail. So does the new user interface. I'm sure these things weren't cheap, and I appreciate the effort here. Ultimately, DirecTV's Genie is a system that continues to surprise and impress us. I don't agree with this review at all. This user does not know what he is talking about. Bravo HD is available in my area. Also, the channels are grouped by HD and then by type. Ex, all the kids HD stations are together. This is much better then Direct TV which has the local stations separated by all there pay view (and yes I know you can customize your guide). WOW gives you the option of the grid and a different menu which I really like. Bottom line, don't listen to this review about WOW. I switched from Direct TV and haven't looked back. Hey, thanks for the feedback. I obviously don't share your opinion about the UltraTV user interface. And while this review was written about 8 months ago, there's still no Bravo HD in Chicagoland. I have reservations about installation. I am looking for tv installation services with home theater. looking professional team can do it. Directv Genie is absolutely INCREDIBLE!!!!!! Being able to record five HD shows at once with a 1 tb hard drive is awesome. The UI is awesome. I love it!!!!!!!!!!!!!!! WOW has horrible and inept customer service from initial appointment set up to installation then on to billing. Great prices for packages but problem after problem otherwise. I just became a WOW Ultra customer, my first whole-home DVR. The author is spot on with the hard to read grid (text-background colors especially), useless groupings of channels, and complicated record set-up/review. I can't comment on their Android or iOS apps. One thing I can say is that WOW delivers the programming at a lower cost. 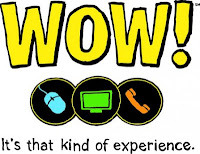 If you care more about spending your money on expanded basic or premium channels, then WOW's for you. If you like slick bells and whistles, then look elsewhere. I think that sums it up for me - WOW is going to be cheaper, but it's not quite as good of an experience. Thanks for your comment. Unless the user interfaces are horrible, comparing them a very small detail when it comes to the grand scheme of things of why we pay for TV, the channels we receive and the price we pay. The thing is though, apples to apples WOW will simply give you more channels at a lower cost without the giant price increases. 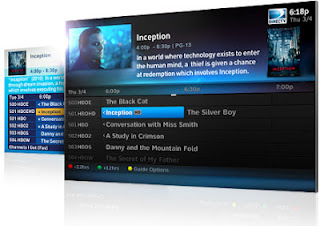 If the price were exactly the same for what you get, Directv would get the nod since it has a slightly better user interface and features. Since this is definitely not the case, WOW wins EASILY. I've had Directv and liked it but their prices are far higher after promotions. I now have WOW and I have more channels and pay far less and after the promotion, my price went up $10. They did an update on the grid guide which I hated at first because it was difficult to read as the article stated, but not anymore. Customer service WOW is definitely better. I'm in the Detroit area and have Bravo HD and NFL Network HD. This is a really helpful review. I was a DTV subscriber for many years. We've had WOW Ultra since it was first offered in our area 3 years ago; we switched originally due to cost. We briefly went back to DirecTV, but the pre-Genie whole-home DVR was no comparison; so we cancelled a month later and went back to WOW. Recently I've been contemplating going back to DirecTV (mostly for Sunday Ticket), but was worried the DVR experience wouldn't be up to snuff. This review helped allay most of my fears. One thing I'm curious about: We have five people in our house (3 teenagers), with often four different programs on at a time in different rooms. I read somewhere that Genie only supports live playback on 3 devices at once. Is that true?